Political/Event/Sports photographer in Canberra for Keating Media and Inside Canberra. Father of two, ex-pro beach volleyball player, sports and nature lover. May 9 - National Press Club - Post Budget Address by Scott Morrison, High Court Katy Gallagher Decision - Press Conferences - Christian Porter and Bill Shorten. May 2 - Doorstop interview with Senator Michaelia Cash to launch the Australian 2018 Jobs report at Canberra's Merici College. May 22 - Andrew Forrest Mindaroo event at Parliament House to announce $400 million donation featuring the Prime Minister, Russell Crowe and Herb Elliot. May 10 - Photos from the Post Budget Address by the Treasurer and photos from the House of Reps Question Time. May 9 - At Parliament House for the Inside Canberra budget coverage including photos from when the Treasurer delivered the budget and photos from the Press Gallery 'boxes' as representatives talk about the budget. 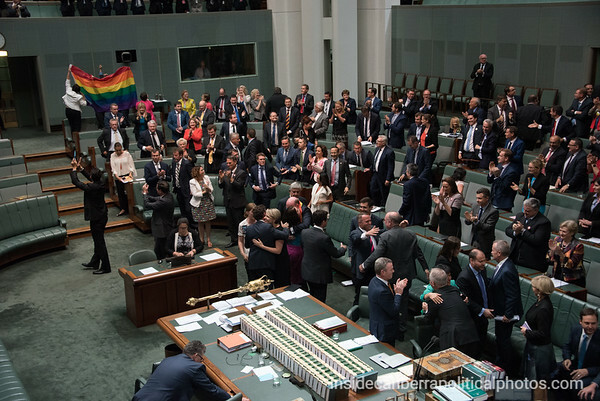 May 8 - Photographed the unveiling of the Midwinter Ball poster and a Fairfax Media protest at Parliament House. May 4 - I was at the National Press Club to take photos of Simon Birmingham, Minister for Education and Training as he delivered his address. As the Minister said, there was an interesting side event as protesters took to the stage. There will be sharing icons with the photos, so grateful if you share any photos that you like.